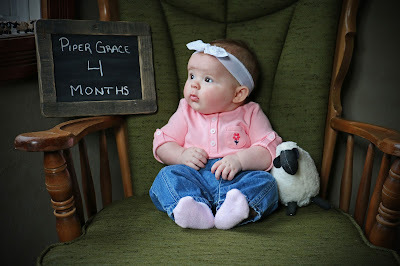 I have my butterflies in my stomach as I begin to type up Piper's four month update for you all. 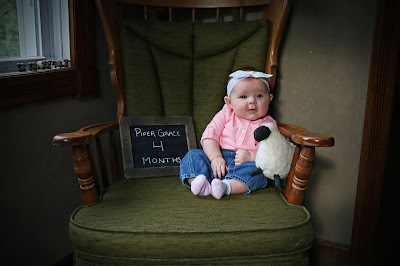 Four months; how, just how is she already four months old?! These updates are happening later and later (she's now 4 1/2 months) as I become more and more in denial that this little girl is just not going to stop aging. Sigh. 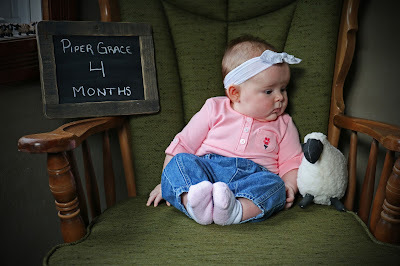 This month, Piper is doing so well, all around. She found her feet, and mastered putting her toes in her mouth. She is sitting up better and has identified some true favorite things. Her toy keys being at the top of that list. Piper weighed in at 16 lbs. 15 oz. and was 25 1/4 inches long at her 4 month check up. She is staying in the same percentiles she was when she was born. (Her head still being in the 95th percentile.) She is one smart, healthy girl! Piper spent just about the entire month sleeping through the night for us. Piper's feeding and nap/sleep schedules were all chosen by Piper. Ever since she was weeks old, I tried to really tune into her and let her tell me when she wanted fed, held, to sleep, etc. Since I am such a planner by nature, this has been a good lesson for me to let her take the lead on these things. It took some time for me to master the signals she was giving me, but we've got it down for now. Wake anytime from 5 - 7 a.m. Play with dad and bath time at 6:00 p.m.
Dream feed at 10:00 p.m.
*Times tend to vary day by day as I still go from her cues but this is the general schedule she likes to keep. With each feed, I offer Piper 6 ounces of formula. We use Similac Advanced. She usually drinks the entire 6 ounces at the first morning feed, one of the mid day feeds and the dream feed. The rest of the bottles can be anywhere from 3-5 ounces. It just depends on how she is feeling. I don't make her eat any more than she wants to. We did introduce Piper to rice cereal at 3 1/2 months old, but that only lasted about 4 days. It was a nice introduction to the spoon but her tongue thrust reflux was still pretty strong, so we are going to try again soon. 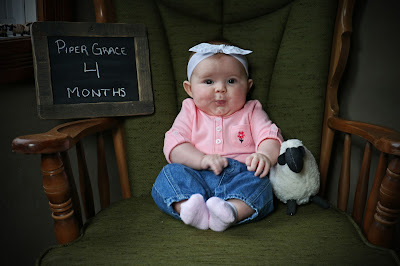 I am excited to be introducing other foods to her in the coming months! This past month, we have been trying to break Piper of the swaddle. She use to sleep in a swaddle me at night, which I do believe helped her begin to sleep through the night. However, as she began to grow out of it this past month, we were forced to have her sleep with her hands free. I held my breath the first night, sure that this would break her (very nice) sleeping routine, but it didn't change a thing! Phew. Piper still likes to be swaddled with a light blanket for her day-time naps. She really only tolerates not being swaddled after her dream feed. She is also still sleeping in her Rock n' Play (pediatrician's orders) since she is still battling GERD/Acid Reflux. I began to ween her off of her medicine for GERD after her 4 month appointment and she is now completely off her medication! The doctor said that we could try to ween her off the medication but that she may still need it until 6 - 8 months. So far, she seems to be doing good without it. The same goes with the Rock n' Play; she will probably be sleeping in that until about 6-8 months. The pediatrician recommended her not be crib trained throughout the night until at least 6 months. Both my husband and I are fine with that! We just love having her sleep next to the bed; within arms reach. My husband actually wants to wait until a year. We will of course follow Piper's lead on this, too. However, my husband really likes to sit up and check on Piper a lot throughout the night. It's really sweet, actually but very tiring for both of us as I wake up with him each time he jumps up to check on her, too. Loving baths more and more! 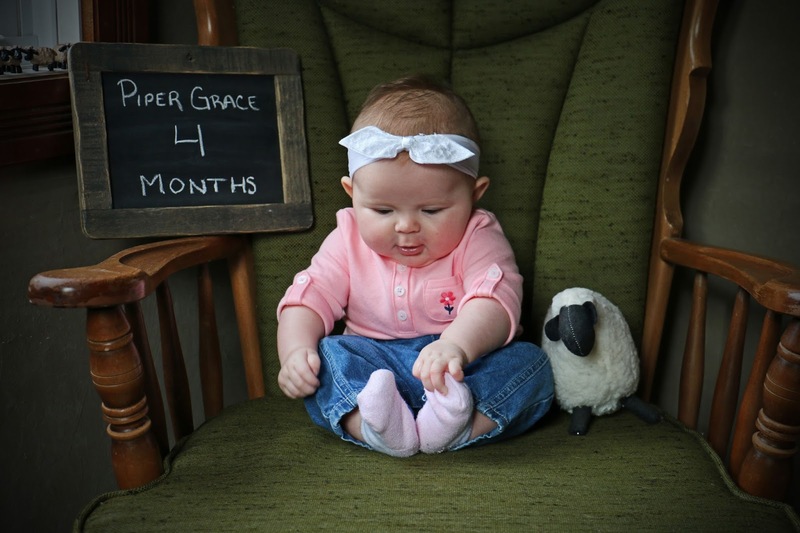 Piper is such an easy going baby, for the most part. She really only cries if she needs something (diaper change, fed, a nap, etc.). Every once in a while she'll have a bad day and will give us a witching hour or two in the evenings. She also has been teething; off and on. Some days she's drooling up a storm and other days, she seems fine. I think I'll cry when I see her first tooth coming through. Time can slow down, any time now. She is at the perfect age where everything is new and exciting and yet, she still has to be in mommy or daddy's arms to experience it all. I love, love, love 4 months. My heart is so full and I feel like the luckiest girl in the world to be Piper's mom. God is good! She has the cutest face.